Now that I’ve scared you away from reading this article let me try again. We’ve all heard of the terms lactic acid, lactate threshold, anaerobic threshold, VO2 max. As much as these terms are discussed in the world of the exercise physiologist, the main message is still the same; how to train appropriately for the result you want. The data collected during a lactate test can provide the athlete with specific heart rate zones for training, racing and recovering. To understand the value of lactate, a brief (very brief, I promise) discussion about muscle physiology is helpful. During exercise the contribution of fats and carbohydrates to energy production is regulated by how hard we train and what type of training we’re doing. The energy that is contained within the chemical structure of carbohydrates, fats, and proteins is not released in the body suddenly but rather, it is released slowly in small quantities during complex, enzymatically-controlled reactions. Fats take a long time (up to 9 hours) to be broken down into an usable form of energy and need a sufficient supply of oxygen (an aerobic process) to do so. Carbohydrates are broken down into glucose and is either used immediately for energy or stored in the muscles and liver as glycogen. The subsequent breakdown of glycogen does not require oxygen and is an anaerobic process. During the breakdown of glycogen into a usable form of energy known as adenosine triphospahte (ATP), a compound known as pyruvate is produced. As exercise intensity increases large amounts of pyruvate are produced very quickly. If the body is unable to use all of the pyruvate being produced, the excess is converted in lactate. Lactate is then reconverted back to pyruvate producing more energy. At some point the body is unable to use all of the lactate produced, the excess then binds with hydrogen ions producing lactic acid. When too much lactic acid accumulates, we begin to experience that dreaded heavy, burning feeling in our muscles that ultimately causes us to go no further. 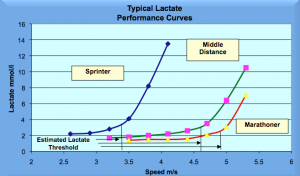 Why are lactate levels important? As athletes we seem to be concerned with out heart rate response to a workout. We do LSD runs at a low heart rate (50-60% target heart rate or THR), tempo runs at 70-80% and speed workouts at 80% to full max. However, without knowing how our bodies are utilizing lactate as an energy source, we’re basically training with a piece of the puzzle missing. Blood lactate levels are an indication of workout intensity. To measure lactate levels, blood samples are taken (via a small pin prick) during rest and at set intervals during a bike or run test. The point at which lactate levels begin to increase above a specified baseline (known as lactate threshold or LT) is typically at about 60% THR. In a highly-trained athlete, lactate threshold can increase to 70% THR or above. This would mean that a highly-trained athlete might be running too slow if he/she were to solely use his heart rate response to determine the intensity of training. Another significant lactate measurement is the anaerobic threshold (AT). This is the point at which blood lactate levels rise sharply above a higher specified level and typically correlates to 80% THR in the average athlete. Again, the highly-trained athlete might achieve higher heart rate responses at a lower lactate level. An athlete’s ability to use or clear out lactate from their working muscles quickly could be the difference between first and second place. Or just finishing the race with a smile.